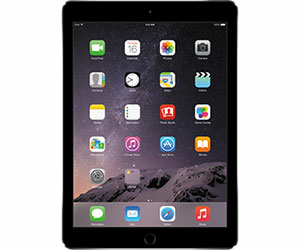 At 6.1 mm thin and weighing less than a pound, Apple's iPad Air 2, which was released in October 2014, features Touch ID and a precision unibody enclosure made of anodized aluminum. The display features a fully-laminated design with a custom anti-reflective coating that reduces glare by 56 percent over previous versions and operates at a resolution of 2048 x 1536 (264 ppi). Powered by an Apple-designed A8X chip and M8 motion coprocessor, the iPad Air 2 also features 802.11ac Wi-Fi with Multiple-In-Multiple-Out (MIMO) technology. An 8MP sensor and advanced optics in the iSight camera allow for the capture of 1080p HD video, while a FaceTime HD camera can take 1.2MP photos with burst mode support and exposure control. The iPad Air 2 is available in two storage capacities (32GB and 128GB) and three finishes (Silver, Space Gray and Gold). If you haven't purchased from Adorama before, see these step-by-step instructions to secure this deal.